BDN's Andrew Slater was on the scene during the Boost Mobile Elite 24 this weekend, where he caught up with Blue Devil target Kyrie Irving for another in detailed depth interview. Join BDN Premium for full site access and be in the know. After a morning of community service in the Bronx, the twenty-four players in the Boost Mobile Elite 24 were bussed to The Sports Club/LA on the east side of Manhattan, where they began what was referred to as a training and combine session. The staff initially had the players separate into 24 various stations designed to work different aspects of strength and conditioning. The stations included boxing, pulling a tire with a rope, lateral platform jumping exercises, etc. After the players went through the various stations, they divided the kids into four groups and measured them, in terms of their standing and running vertical leap, the number of repetitions they could lift in a row with two dumbbells of moderate weight, and how fast they could run the entire court, both with and without dribbling a basketball. The players then were taken to another gym in the same facility to have a Question and Answer session with a panel of Peter Vecsey , Quinton “Rampage” Jackson, Kevin Love, Brandon Jennings, and Tyreke Evans. The Q and A was moderated by Chris Broussard. Vecsey tried to lecture the kids on the history of the tournament and the players that had graced the court before them. Love talked about his experience at the inaugural game, the transition to both the college and pro game, and pointed out the number of players that have reached the NBA as well as the others that will follow from the initial game. Jennings talked about his year abroad in Italy, while making notice of his relative success, the difficulty of coming off of the bench, and the women. Evans attempted to communicate his thoughts on his transition from shooting guard to point guard at the University of Memphis. Rampage said he liked the WWF, while growing up in Memphis, and therefore tried to do wrestling in high school. He mentioned that he loved to fight as a kid, but cautioned the kids that you can’t always walk around looking for a fight as an adult. Following this session, the kids broke into their two predetermined teams and began a competitive scrimmage, as a means of practicing for the following evening at Rucker Park in Harlem. Roscoe Smith, a Duke recruit from Baltimore, swished a three-pointer with 3.4 seconds remaining to give his team the win, 99-98. Subsequently, the twenty-four prospects broke into separate areas of the court for individual interview sessions. Kyrie Irving, the smooth and pensive New Jersey guard, spoke with Blue Devil Nation about a variety of issues, including his goals for the upcoming year, the decision process that went into his recent trimming of teams to a far more manageable six, his relationship with Harrison Barnes, what he will be looking for on his official visits, and the utility of Twitter, amongst others. Six schools and you should save them for your ever growing Twitter audience, but can you talk about the decision process? Yeah, yeah. I’m going to save them for tomorrow, even though some people around here have been pressuring me to get it. I'm not talking about you, but others. Can you talk about your decision process? Yeah, sure. It took a while. Me and my father sat down, along with my uncle..
That was going to be another question. Yeah, you know we sat down and we evaluated each school. We were going through, well, who had the best to offer. That’s what came down to my six schools that I’m going to announce tomorrow. Sure, what were the factors that most contributed to your final six? So, academics were actually important to you? Because there are always a lot of people, fans included, that are skeptical when they read that kids are actually interested in academics. Personally, I always try to keep an open mind and treat everyone as an individual case. I assumed you were, but I didn’t know for sure. I knew you did well in school. No, I knew that number because you mentioned in an earlier interview. Yeah, I don’t really talk about it that much. I guess they’re not that concerned with your off-the-court life. Yeah, family atmosphere, academics, and just how comfortable I am with the coaching staff and just everybody coach wise because when I see the school, it’s going to be where I’m not signing with them for four years, I’m signing with them for a long time. A long lifetime, God willing. Who did you ultimately seek input from? Well, I guess you answered that one. Yeah, my father and my uncle. They’ve been there throughout. Was it a family/group decision or much more of a personal one? It was more of a personal one I would say. By the way, was your sister involved in the decision at all too? No, no way. It was more of a personal decision because I talk to most of the schools. They call me all of the time. Yeah, it was more of a personal one. Other than “a home away from home,” as you’ve mentioned in the past, what will you be looking for on your official visits? I’m just going to be evaluating everything. Just when I step on the campus.. Anything specific or more of a feel? It’ll be more of a feel. Just how comfortable I am, how the players interact with the coaches and how the players interact with themselves. Just everything about them. I’m going to evaluate. But I’d say mainly with the coaching staff and the players. That’s it. Well, they’re going to be the ones that you’re going to be spending most of your time with. Having been a kid that was under-recruited at Montclair Kimberley, how has the reality of the process or experience been, compared to what you expected a top-ranked player to have? Now that you’ve seen the other side, is it kind of what you expected or is it more? Let’s say last summer versus now, when the “gurus” have discovered you and you’ve shot up the charts. I’ve got to say I’m really proud of you. Thanks, man. I have to say it’s been great. Especially this time last summer, I was really barely even known. Having the opportunity, you know, to be a top ten or whatever they say I am now, I feel like I don’t want to let them take that away. I feel like I have to kind of step back and just..
Was it what you thought it would be like? (laughing) It’s even a little bit more. Yeah, it makes me really happy and I’m proud to be a top ten player because I worked hard all summer. Yeah, you did. Is your family enjoying your success? Yeah, no, they definitely are. My family has been there since I was just a little kid playing in my backyard. It’s just been great. I’ve just enjoyed this whole entire summer. That’s great that you are all enjoying it. To clarify and potentially squash some concerns, there was a video interview that you did in Portland with Selby and he was strongly hinting that Indiana was going to be your choice. Did he know something or was he just purely speculating? (laughing) No, no, he was just joking around. Of all things that you accomplished this year, what are you most proud of? I’m proud of everything. I can’t name a specific thing because there have been so many moments, particularly this summer. It started off when, well, it actually started when I went to…well, it was a learning experience for me when I was at the NBA Camp. That was the first time I came to a camp and there were so many top players there. It wasn’t like there was one player that wasn’t any good. That was definitely an eye-opener. It made me even hungrier. Yeah, exactly, the two “H”s that I live by. It just made me humble and hungry to just go out there and destroy the whole AAU circuit. What’s your relationship like with Harrison Barnes? Can you provide a scouting report? I saw you two sitting together. (laughing) Oh, yeah, well, I mean he calls me his “little brother,” but I..
Yeah, I don’t know, but I’m close with him. We developed a relationship over the summer. It started at NBA Camp. We don’t really discuss Duke to a large extent, but we do discuss it and we have a very good relationship. So there’s definitely a connection between you two..
What are your goals and hopes for the next twelve months? McDonald’s All-American? Repeat as state champions? Those are personal goals, but, as a team, the national championship and the state championship. Before every season, well, you know, even before every summer, I always set goals. On a personal level, I want to make the Jordan Classic and do all of those all-star games. On a team level, I need to continue to develop my leadership and do the intangibles that my team needs, which will hopefully prepare me for college. Yeah, well, my father had to like beg me to take a break. For some reason, it’s just a mental thing with me, but I just can’t take breaks. I just can’t. I still have that feeling that if and when I take a break, that’s when other people will start to work harder than me. So, I barely take breaks and it really takes a toll. My body is hurting right now. In your writing, there’s always a series of cycles, where you initially do lengthy, intense workouts, then play in tournaments where you carry a heavy burden and play a lot of competitive games in a short period of time, and finally there are periods where you crash and “chill.” Is it a matter of trial and error with knowing when to push your body or is it more a matter of planning and scheduling? No, I don’t schedule it. It got to a point, earlier in the summer, where I wouldn’t even know what or where games or tournaments were. I would just go. It really takes a toll on my body, but, after a while, you kind of get used to it. You know, towards the end of the summer, you start taking a lot of breaks and you get ready for the high school season. Ideally, what would you like to do with your body to further enhance your overall game? Strength? Cardio? My strength. My cardio is fine. You can run all day. Especially when you have to bear a heavy burden with Roadrunners. Well, I mean people, who have watched you on that team, can judge for themselves. Yeah, I don’t want to go there right now. Yeah, I know who you are. How’re you doing, Doron? Can you talk about your mentality as you prepare to play at the Rucker and the GOAT? Are you definitely going to be at the GOAT on Saturday night? Are you looking to pick your spots? Showcase? Go in with an open mind and have fun? Well, you can tell that people are going to be putting up shots and that there are no positions out here. People are going to be looking for theirs. I’m not going to stress out over it or anything. People are trying to, well, it’s a whole political thing. Are people really stressing a little bit? Yeah, behind the scenes, they are a little bit, but they shouldn’t. Whether on the Roadrunners or the Celtics, do you ever look to try to help your teammates out, in terms of generating scholarships or offering advice? Yeah, when I play with the NJ Celtics, I think it benefited some of the players on the team because, you know, I don’t want to sound arrogant, but a lot of college coaches came to see me play so..
That’s my point. There’s an opportunity to be generous and some guys, who already have all the scholarships they need, won’t. Yeah, especially on the Roadrunners too. Absolutely, but also on the Celtics, for example, I know towards the end of the high school season that Kevin Boyle’s son didn’t have any Division One scholarship offers. God knows if he does now, but.. Right, right, he goes for almost thirty. Can you talk about Twitter and its usefulness in trying to get your messages out there? It’s just a way to update people on what’s going on in my life and in my mind. It’s acting as a virtual megaphone to get your words to a mass audience that‘s interested in what you have to say. Yeah, that’s exactly what it is. This may be the last time I speak with you and I always try to be objective, but you’ve become my guy and I just wanted to thank you for your help with the interviews and wish you the best of luck in the future. Just outside the glitz, glamour, tangible heat, and pulsating excitement of Las Vegas is Henderson, Nevada, where thousands of young men have gathered to showcase their wares in front of hundreds of college coaches. In the second half of the July live period, many are anxious to impress the coaches in the stands in order to earn at least one more scholarship offer than they already have, but one young man who doesn’t have that concern is Josh Hairston of Spotsylvania, Virginia. 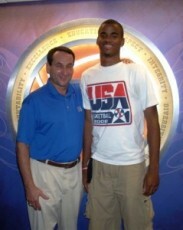 Hairston has verbally committed to join the Duke Blue Devils in the class of 2010. In the Adidas Super 64 Tournament, the Virginian is playing for DC Assault, an AAU program founded by Curtis Malone, the stepfather of Duke point guard Nolan Smith. This Assault team has won both the Adidas Super 64 fifteen year old and sixteen year old age groups in the prior years, respectively. Winning is something that Hairston has become accustomed to on the AAU circuit, but, during this past high school season, he led his Spotsylvania team to their first state title in school history. Recently, he decided to transfer for his senior season to Rockville, Maryland’s Montrose Christian, where he will be instructed by venerable high school coach Stu Vetter and be a teammate of Justin Anderson, one of the top rising sophomores in the country and a fellow Spotsylvanian. If the handicappers in the nearby casinos were able to offer wagers on the 2009 Adidas Super 64 tournament, the DC Assault would be the odds-on favorites, with Hairston, Notre Dame commit Eric Atkins, and Duke commit Tyler Thornton, the reigning MVP, leading the way. After a game against the KC Pump ’N Run, 6’8” Josh Hairston sat down with Blue Devil Nation to discuss, amongst other things, his recent transfer to Montrose Christian, what the Duke coaches are looking for him to work on, winning the first state title in his hometown school’s history, his chemistry with Tyler Thornton, and how he dealt with an idiot in the middle of nowhere. Can you talk about your decision to transfer to Montrose from your hometown high school? Montrose? Sure. The decision was finalized really in mid to late June. I talked to my parents about it. The school that I was at was in Spotsylvania, Virginia. You know it was nothing against them. For the three years that I’d been there, I had been the man, you know, and, if I had continued to be there, there really would be no competition for me there in my senior year. You know I wanted to get better and, you know, further my development so that, you know, when I get down to Duke, I’ll be able to come in and play. Montrose was just it. I’ve seen their facilities and I mean you look at Coach Vetter‘s resume. He’s put guys in the NBA and he prepares them for college. So that’s what I wanted. They play a national schedule. They play powerhouse programs and I’m looking forward to it. That’s a good attitude. I was talking with Justin Anderson a couple of weeks ago and he was telling me that you were a role model of his. Did he help at all with your decision or with the transition? Oh, me and Justin, you know, he, um, with the transition part, he did. The decision, you know, was made by myself and my family, but, yeah, we grew up playing basketball together. Well, I remember from the interview that he said, when he was the eighth grader on the varsity, that the older guys on the team were all giving him a really hard time and that you were the one that stood up for him and (2000 word interview awaits you) [private] sort of protected him and treated him well. Yeah, Justin was one of those young, exceptionally talented kids and everybody in our area knew that he was going to be big and I think a lot of the seniors and older guys didn’t like seeing a younger guy getting all of the attention. He’s definitely helped me with the transition. You know introducing me to everybody and helping me make the transition a little smoother. Sure, he was saying you guys are going to be living in the same house right near the school. It was, for lack of a better term, a “basketball house” that was filled with players that live a good distance from the school. Yeah, exactly, the house is like forty-five seconds to a minute from the school. We’re both going to live there because otherwise we both live, like, an hour and a half from the school. So the commute both ways would be three hours of your day. Yeah, it would’ve been crazy that way. Have you felt a target on your back this summer since committing to Duke or is that something you embrace? Yeah, you know, it’s crazy. Do you find there are guys trying to make their name off of you? Even today, you know, a lot of people say that Duke recruits have it the worst and it may be true because you have guys all of a sudden trying to go hard and get in your face all of the time. You know they may play terrible one game, but, when they see that they’ve got you, they play their hardest game ever (chuckles). That’s how teams are with us. With the Assault, a team could lose by thirty and then they give us their hardest game ever. It’s probably something you embrace or at least I would. It is. We love it. We love competition. We go after it and that’s how we make our name. Sure. What are some things, be it drills, workout routine, etc, that the Duke coaches have recommended that you can work on or should work on over the summer before you reach the campus? Yeah, I need to play more outside, but also be able to play inside. They see my playing the role that Kyle Singler is playing now. Yeah, but I’ve definitely been working on my ball-handling with my dad. He’s got me outside all of the time. We’re shooting a lot of jump shots and we’re working on ball-handling and stuff. Now, at Montrose, do you know where you will definitely be playing? The three and the four. The same thing and so that’ll be helpful. I’m going to playing inside and outside. Montrose lost a very talented frontline so I wasn’t sure where exactly they’d play you, but I figured you’d get some assurances. At a school, like Spotsylvania, where they have no height inside, there isn’t much of a choice. They’re going to stick you inside for the majority of the game. Yeah, at my old school, I was always the five. But now going onto a national school, with more of a pool to draw from, you’re going to be playing more of your natural college position, which should help with the transition. I thought it was good move on your part. Yeah, it’ll allow me to learn more about the three and four positions. Actually, that hits on another question I was going to ask you. Do you know of some events or tournaments that fans can come and watch you this upcoming season? Off the top of my head, I can’t, but I know there are going to be some TV games that they can catch me and hopefully support me. Okay, they’ll have to check their TV schedules. I never asked you , but is there anyone that you try to model your game after? Yeah, it’s actually a little weird. (chuckles) Well, a lot of people say it’s weird, but I actually model my game after Carmelo Anthony. He’s my favorite player in the NBA and I mean I just love to watch him play. Well, I guess you guys are the same height. Yeah, we are. If he’s on TV, I just have to watch his game. Can you talk about the chemistry that you have with Tyler Thornton? I was talking with him after a high school game about the fact that you’re going to be entering Duke with a teammate that already knows where you like to catch the ball, how you play, etc. and what an advantage that is over the normal freshmen. Yeah, it’s crazy. I’ve known him for three years and our chemistry has just grown and grown. This was actually my first tournament with them. I remember that you said that. Yeah, it was my first tournament. You guys won it and then won five big tournaments in a row. Yeah, we did. Even this year, it’s gotten nothing, but better. I can cut to the basket and without even looking he knows where I’m going. Exactly, we had that play off of the inbounds play where he and I just knew what was going to happen. It’s just something that we have with each other. Can you give a scouting report on Tyler Thornton? He’s a floor general. He’s one of the hardest competitors that you will ever come across . If you are on offense, you have to account for him because he will guard your best player and he will lock him up. He gets into it and defense is his specialty. Can you give the audience a current scouting report on yourself? How are teams trying to defend you now? What do they say are your strengths and weaknesses? Sure, well, I don’t know if you saw, but my first couple of shots were jump shots. They played off of you initially. Yeah, they step up with their defenders and then I just try to go right by them because they usually run at me hard. How about winning the state title? That’s got to be one of the best feelings or crowning achievements of your life. Yeah, it was probably one of the best feelings in the world we were real senior heavy. Now, wasn’t that the first state title in school history? Yeah, exactly, it was the first title in school history and it was big because we had a lot of seniors on the team and that’s who I came in with. Just to see those guys finish their, you know, high school careers out with a state title was big. It was really important to me. It’s probably one of the highlights of your life so far. It definitely may be number one. If not, it’s definitely in the top five of my basketball career. Well, hopefully, you’ll have a lot more to choose from in the future. Yeah, I hope so too. That was a great feeling and a great game. Just a great game. How have you done this AAU season? You know I wanted to be sure to touch on this subject because you guys won big at fifteen level and then you won a lot again at the sixteen level. Have you found the transition to the seventeen-and-under to be much more difficult than you anticipated? Have you found the last step on this particular ladder to be the most challenging? Yeah, definitely. We had a lot of struggles early. Now, we’ve won our last two and we just want to keep on going. I, myself, struggled a little bit in the springtime. Not only myself, but Tyler and Eric as well. We struggled and fell in the rankings. Was it an injury or something physical? No, it wasn’t anything physical. I can’t figure out what happened, but for a period of time we struggled wither mentally or with our chemistry or something. We didn’t seem to have the same chemistry that we had the first two years, but we’ve gotten it back and we’re starting to beat team like we did when we were in our fifteens and sixteens. People are starting to realize that and we’ve just got to keep it up. By the way, Tyler had said you were a mix between KG and Tim Duncan, that you had a nice little hook, but you could step out, face up, and take your man off of the dribble or shoot the jumper. Also, that you were becoming great on defense, with blocking shots and defensive rebounding. Of all the kids you’ve faced, who have you found to be the most difficult to guard? Jared Sullinger. I’ve got to go with Jared Sullinger. Sullinger? He’s a beast inside. Yeah, Sullinger. If you look at him and you look at me, he outweighs me by a whole lot. It’s probably about fifty pounds. He’s very tough to stay in front of. That’s another thing. Are you trying to get bigger and what’s your progress like in that department? I’m trying to. Yeah, I’m definitely trying to. I’ve been lifting and I start to go up to Montrose in August and Coach Stein had me up there lifting. Me and my dad have been hitting the weight room hard. How much do you weigh now and how big do you want to get? I weigh about 215 now and I’d like to weigh around 220 by the time school starts. I just want to add solid muscle and so I‘ve been working on that and I‘ll continue to. How are the facilities like up there? Oh, they’re nice. They’re very nice. Who’s been your role model? Your dad? My dad is definitely the one. He’s been the one to tell that no matter what to keep working hard. Whether we’re down or up by thirty, just keep working hard and never give up. (laughs) Oh, yeah, we were. It was somewhere in the middle of nowhere. Yeah, believe me. It was literally out in the middle of nowhere We were beating a team by thirty and there was this guy who was just ragging on me for the whole entire game. I was killing them too. I think I had like twenty-seven or twenty-eight points so far and this was at, like, the start of the fourth quarter. The dude is ragging me and ragging me and I finally got fed up with him and I said something to him. Then, my dad said, you know, calm down, relax, and don’t even get into it. There’s people in this world that are like that. We wound up winning by thirty, but, yeah, he was just obsessed with me. He was obsessed for some reason. There’s people like that, but that was probably the worst experience that I’ve had. Usually, if people are going to say anything, they’ll say something at the beginning and realize that it’s not working on me, but this guy was out there. Do you think he was crazy? I don’t know what the dude’s problem was, but usually people aren’t like that to me for very long. Don’t ever let them get to you. That’s it for me today. I see the team is leaving. Thank you very much, Josh. Oh, no problem. Thanks for talking with me. Sure, I’ll be watching you throughout the tournament. Good luck to you and the Assault. BDN Premium Interview – Is Duke set to offer a third Plumlee? 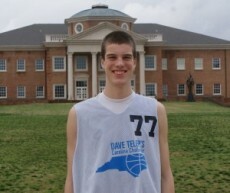 Marshall Plumlee is a listed 6’11 1/2” center from Warsaw, Indiana, who plays for Christ School in Arden, North Carolina. The rising junior has been on the radar of recruiters for years due to his size and, more importantly, pedigree, as the youngest brother of two current Duke big men. At the recent Super 64 Adidas AAU event, Plumlee was observed by many of the nation’s elite coaches and programs, including Florida, Notre Dame, Indiana, North Carolina, Purdue, and Duke.While playing with the sixteen-and-under Indiana Elite team, Marshall led them to a Sweet Sixteen match up against Quinn Cook and D.C. Assault, who won the contest convincingly. Over the course of the tournament, Marshall spoke with Blue Devil Nation about a variety of issues, including what he’s been working on this summer, what Duke fans can expect out of Mason Plumlee, and how he differs from his older brothers on the court. You’ve gotten some more offers coming in recently and there were plenty of coaches here to observe you, amongst others, today. Do you still view this as very early in your recruitment? Do you have a timeline in mind for when you’d like to decide? Yeah, it’s still pretty early. At this point, I’m learning more about schools, [private] but, knowing the recruiting process, I’m more ignoring the recruiting process and still just focusing on getting ready for the upcoming season. I’ve still got a long ways to go. It’s been pretty exciting. Yeah, absolutely. The gym was so packed today I was just grateful that they didn’t have an fire marshals. (Laughs) Yeah, it was packed and hot out there. What style of play do you feel best suits your game? Does it change now that you’ve grown to nearly seven feet? I’ve always been a back-to-the-basket kind of player, but I’ve got to say my game is more fifteen feet and in. I’m trying to work on my ball-handling and on my fifteen foot shot. You know just trying to expand my game. You hit all of your free throws in the second half. Is foul shooting something that you’ve been working on as well? No, no, no, you were fine with that today. It’s something I’ve got to continue to work on. Have you visited a lot of schools? Well, I’ve visited a lot of schools with my brothers, but not necessarily for me. On my own, I’ve visited schools like IU, Notre Dame, and UNC. It’s exciting. Sure, you’re the one being coveted. Yeah, it’s exciting to be taken around and you’re the one being recruited, instead of just following around your older brothers. Do you think it’s a major advantage for you having had two older brothers that have just gone through the process? Most definitely. It’s a huge advantage, especially not just one brother, but two brothers. So, I have an idea of all the coaches that I’ve met and come across through their experiences. I’ve also looked at a variety of conferences. I feel like I’m pretty well off and I don’t feel as though I should feel rushed into any decisions. I’ve spoken to Mason about this, but what was the move like for you when you came to the Christ School. You moved from Warsaw, Indiana to Arden, North Carolina. That was exciting. It was a little tough being away from home and your family, but the experience was great and I love the school. You’re there with two hundred other kids in the same situation as you. You know, not sure about being away from home. When I was in Asheville last year, I actually drove over. I thought I might as well see it. It’s so close. Mason had said he was a little unsure at first as well, but then it turned around. Yeah, but now I couldn’t be happier. I was checking my notes from a few prior interviews. Mason had mentioned that he thought Miles was the best athlete of the brothers, but that you were the best back-to-the-basket player. Do you feel that’s an accurate assessment? Yeah, well, I guess that’s a good assessment, but I still feel like I’ve got a long ways to go before I reach my brothers’ levels in anything. They’re both really good. Miles and Mason are both great athletes and I’m so happy with how they’ve done. I just hope that I can be any bit like them…well, that’d be exciting. I’m still hoping to expand my game and develop physically. By the way, how tall are you right now? Can you give the audience a scouting report on Mason and what they can expect? Sure, they can expect to see him continuing to improve over the course of the season. I can guarantee that. They should expect him to improve every single game. He’s very head strong and determined. He’s got a great attitude. What you don’t see on the court is the amount of time he puts into the game off of the court. I’m sure. He seems like a great kid. He is. Everyone has a pretty good idea of what he can do on the court right now, but I can promise you that he’s been working very hard on improving and expanding his game. Now I remember that Mason said that your mother was really more of a tennis player, but they needed to find a sneaky way to find a scholarship. (Laughs) Yeah, yeah. I play tennis too actually. Really? I’ve got to watch out for that serve. Having said that, how do you think it differentiates you from other kids in having both of your parents play college basketball? Compared to your parents, mine would’ve looked like a pair of midgets. (Laughs) Yeah, it helps and I love them to death. The most important thing I’ve learned to do is…You know how you tend to just blow your parents off because they’re just always giving you advice, but really there is just so much that I don’t know. So I’m just trying to take it all in. Sure, they must have a lot more to share than the average parent. Yeah, definitely. My mom and my dad have helped me out greatly. Did they make the trip? I’ve seen them at lot of other tournaments and events, but I didn’t see them here. No, they didn’t make this trip. Well, it’s so hot anyway. Let’s talk about your strengths and some areas that you’d like to improve upon. I think my strengths are my defense and my ability to run the floor. Also, I can and like to throw outlet passes. My weaknesses would be my ball handling and my shooting. I want to develop a strong game from, maybe, seventeen feet and in. Just working on getting quick dribbles or pulling up for a jump shot. Oh, and free throws, of course. How do you feel about your development, with respect to low-post moves? Do you have any role models in basketball? I’ve always personally admired Kevin Garnett for the energy he brings and how he plays. I try to just go out there and give it my all. You’re different than your brothers in that you are a pure center at a younger age. Can you talk about being a pure center and how you feel it differentiates it you from your brothers? It came more naturally to me. I’ve always been pretty tall. Miles was a late bloomer. You were like 6’7” last year. Yeah, I was. I’ve always been pretty tall for my age and I think playing inside just came more naturally for me. I’ve still got a lot of work to do, but I see myself playing down there. I’m probably not going to end up being as big as some of these guys so I’ve got to really work on expanding my game. You were talking the other day about improving your ball-handling and range. Have you begun to seriously hit the weight room? I have. The weight room…I’m not worried at all about that because having seen two brothers go through that. Can you touch on what you’ve seen or heard Miles go through as a result of beginning a college weight room program? I’m not worried about it. It’s something that’s going to come. I’ve worked in the weight room obviously. You can tell. I know Mason has begun the program. Yeah, it’s something that I’ll seriously ground out, once I stop growing. I didn’t know what you were hoping to look like. Yeah, it’s something where I think I’ll fill out after I stop growing. Well, that touches on something else. Have the doctors talked with you about how tall you’re going to grow to? I have no idea. I’m just going to prepare for anything and, so, I’m just going to work on my skills. That way regardless of how tall I grow to I’ll be prepared. That’s a smart approach. When you’re not at tournaments and other events, what have you been working on this summer? I’ve been working on my footwork and ball-handling. With my footwork, I’ve been jumping rope. I’ve been jumping a lot of rope and doing a lot of stepladders. You know just trying to improve my lateral quickness. Yeah, I feel I’m finally starting to get quicker end-to-end. Yeah, I think you’ve made some strides in that area. How do you feel about your shot-blocking right now? Do you think this tournament has been a good example of your current ability to block shots? I feel I still have a lot of work to do in that area. I try to come on the help side, but I’ve got to be just a half of a second quicker. Who’s the toughest player you’ve ever defended? Outside of your family…so we don’t get political. Well, when I played the Lopez brothers. Oh, wow. That must’ve been an interesting experience, particularly at your age. Yeah, it was. It was out at Stanford. It was really tough, but amazing. I can beat anybody at video games. Alright, even Mason, I remember he said he was very good at them too. Oh, yeah, I can beat him too. How do you feel you’ve performed over this AAU season.? I feel like I’ve improved a lot. With my performances on the court, I feel like I’ve made great strides. I obviously have a long way to go and I’m going to keep working, but, personally, I feel like I’ve made strides and I’m happy with myself in general. I think I’m on track and I’m going to keep working. How has the team overall been playing? This was a good win against a quality program in the Playaz. Yeah, it was. They beat us earlier in the season on a last second shot and they’ve got some quality players. Kyle Anderson is a potentially interesting point guard prospect. I’ve spoken with him in the past. Yeah, he is. We’ve been coming together. We’re improving and playing together more now. Lastly, since I see someone waving you on, will you be able to make it Cameron for some games this year to see your brothers? Yeah, they (Indiana Elite staff) want me to go. Will I make it to Cameron? Yeah, I‘ll be trying to. I’m going to try to go every chance I can get. Austin Rivers verbally committed to the Florida Gators at a very young age and now per his Dad's wishes, he will visit other schools in August [private] to make sure that Florida is indeed his dream school. His Dad of course, is Glen "Doc" Rivers the head coach of the of one of the NBA's storied franchises, the Boston Celtics. BDN caught up to Rivers where he made it clear that he is still a Gator. "I am definitely committed to Florida and that's where I am going to school. I mean, I don't see why people don't think I am going there. I mean that's where I am committed to and that's where I will go." When talking of what it was like to have a Dad who is in the limelight, Rivers responded, "I just see him as a normal father and or a normal guy. He just has a job that requires to coaches pro athletes. It's cool that he coaches them, but I just look at him as a regular father and nothing special." Austin also gave his mom props, "She's my biggest fan man! She does everything for me and my family and I mean everything. She takes us everywhere, cooks for the team. I mean she has like 12 kids over and will cook for them, so she works the hardest and she should be the most famous one." The word leaked earlier this summer that Austin was seeking to reopen his recruitment. BDN found out during the Nike Peach Jam that Duke was on his short list of schools to visit, but we decided against running with the information at that time due to this being a sensitive issue. Or at least, I thought it was sensitive until Coach Krzyzewski made it clear during the Orlando Showcase and AAU Nationals that he had interest in the outstanding high school baller. Coach K sat alone for one of Rivers games and was joined by assistant coaches during other contests. However, Rivers maintains that his verbal to UF is solid. In fact, I asked him about the Sporting News article which came out the day before saying he reaffirmed his comittment to Florida. "My dad wants me to look at other schools and see what other people have, but I am definitely going to Florida. I will definitely visit other schools out of respect to my father." It wasn't hard to see that Rivers would take an occasional look in the direction of Krzyzewski. "I think it was great to have Coach K looking at me. I'm just going to go up there and look at Duke. I will look at other schools, but right now I want to play basketball at Florida." Rivers said he would take a break mid August and ponder his thoughts while resting up. He also said he thought about graduating early like Duke's incoming freshman Andre Dawkins. His mom wants him to go through the natural process and judging from his answers, she looks to play a big role meaning that she'll likely want Austin to stay in Florida. On the other hand, Doc seems to like the thought of Duke from afar and maybe even North Carolina. For whatever reason, he just wants Austin to go through the recruiting process before signing on the dotted line. BDN has learned that Rivers will make it to Duke sometime this month but a date has yet to be confirmed. Some might say where there is smoke there is a fire, others will say seeing is believing. By the end of the month we should know if there is a chance Duke might pull of a coup and land a guard that fits their system well, be it sheer basketball skills or NBA pedigree. It should also be noted that the Rivers camp contacted Duke earlier in the summer inquiring about a visit. 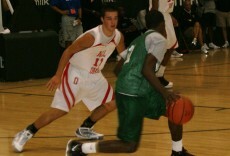 Sidebar - Rivers team played in both the Showcase and Nationals, not to mention a made for TV game on ESPNU. "It's the last tournament of the year and we want to go out with a bang and play as hard as we can," said Rivers after his sixth contest of the week. Life would have been easier for Team Stat but numerous injuries claimed three players off their roster, including one of the nations top players in Brandon Knight. Rivers lived most of his life in Florda, but has also lived elsewhere when his father was involved with NBA teams. "We'll talk and I'll tell him what I did good or bad and analyze the game, but after that it's just Dad and son. It's not always about basketball," said Rivers when asked about his Dad's input after watching his play.